Not to be confused with Fly Guy. This is a Sky Guy. Sky Guys are master balloonists. 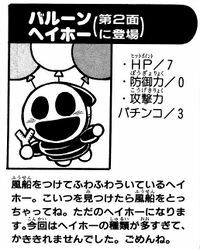 Max HP: 7, Attack Power: 3, Defense Power: 0 We can attack the balloon, too. Once they fall, they're just like normal Shy Guys. I wish I had a balloon so I could float... That looks awesome! Sky Guys are Shy Guys that float using balloons. They appear in Paper Mario, where they shoot at Mario with a slingshot. Sky Guys are always red. The balloons keeping them afloat can be attacked, grounding them and turning them into normal Shy Guys. Outside of battle, Sky Guys attempt to swoop down at Mario to try to make the First Strike just like Paragloombas. This page was last edited on October 29, 2018, at 22:58.